Terrified of speaking in public? Need to practice your pitch? Feeling tongue tied in meetings? Does the thought of meeting a roomful of strangers, preparing an elevator pitch, or giving that big presentation make you nauseous? Have you wondered what it takes to be TEDx-worthy, or how to answer tough questions or network with confidence? Would you like to learn the basic skills and techniques to become a more confident and effective communicator? Kelowna Toastmasters and Okanagan coLab know how critical effective communication skills are and want to help you speak easy(-er) in any or all of the above situations. 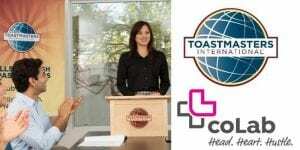 This 6 week course is based on the Toastmasters International communication and leadership program and is the quickest means by which people can jump right into the process of improving their speaking skills. This workshop is for anyone curious to know what Toastmasters is and how the program can help your “head and heart take your hustle to the next level” by speaking confidently and effectively in any situation. This course is geared to those in the Okanagan, and especially those working in the tech and start-up sector, remotely, or in a co-working group such as Okanagan coLab. 6 weeks, every Tuesday starting October 16 to November 20, 2018. RSVP by clicking the green “Register” button on the right. Once you have completed the online registeration, information will be sent to you on payment options. Please note your spot will not be confirmed until your registration fee is received. Space is limited to 12 people to ensure adequate participation for all attendees and will be assigned on a first-paid basis. Pat Nelson has been a member of Toastmasters for more than 25 years and is currently the President of the Kelowna Monday Night Club. Pat has been very active promoting the Toastmasters Youth Leadership Program and is the Co-Leader of Room to Read Okanagan, a volunteer chapter which promotes literacy and education in the developing world. Erin Trifunov joined Toastmasters in April 2016 and has achieved both the Competent Communicator and Competent Leader designation and won the 2018 Area Speech Contests. Erin is currently a Project Manager with a background in communications, marketing research and fund development.